Throughout my life, I have chosen small purgatories instead of making wild leaps. Sometimes it just seemed more prudent to ponder before making an action that may directly impact my path in this wooly wilderness. Please do not typecast me as a 99 pound pantywaist since I’ve also acted rashly to both my benefit and detriment in the realms of love, money, profession and mental well-being. Most of these stationary moments have lasted weeks or maybe months, but there is one in particular that lasted an entire year. I had graduated from my Western Pennsylvania college and decided to take a job as a record store manager and see where my long-term relationship would lead this old sap. I spent most of my days listening to Yes and Neil Young and occasionally laid on the floor while soaking in Everybody Knows This is Knowhere or Yessongs as if they were my current gospel. The other manager used to drive around with a mannequin of skeleton in the backseat of his car and pull a string to make it wave during Halloween, but many times it was in July. He also fantasized about jumping into the trash compactor while setting himself ablaze, so it is pretty certain that this purgatory deviated more towards a personal hell instead of a heaven. However, there was a numb calm to these days spent opening albums and listening to them while folks fawned over Princess Di and her sappy anthem. During these moments of malaise, I was thoroughly embiggened every time that the truck arrived with the latest batch of cut-out cassettes. 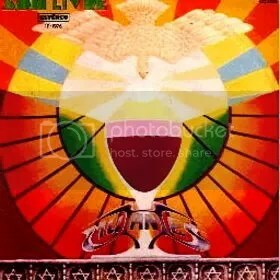 For every Front 242 disaster and emasculated Iggy Pop disaster, there was my virgin experience with Skip Spence, Hawkwind, United States of America, Flaming Groovies as well as the album highlighted here–Lick My Decals Off, Baby. My only experience with the Captain was in a vague appreciation of Trout mask replica that never went past second base. It was all maneuvering and weaving and bobbing without pathos. I still like it, but Lick My Decals was dense, but there was a melancholy about its songs that became addictive. Many may disagree, but Lick My Decals is far superior to anything Captain Beefheart ever recorded. It is a close cousin to Trout Mask Replica and some songs fall victim to the chops and noodling of its predecesor, but this one is really touching if you listen to it as much as I have. “One Rose That I Mean” is one of my favorite tracks as it echoes John Fahey and early Leo Kottke, but there is so much hurt in this instrumental. Its meager crescendos seem crippled by the emotion involved in its creation. For example, “Petrifed Forest” starts off with a kaleidoscope of stuttering riffs, poetic rants and rhythmic acrobatics, but there is a break in the storm and he gets it suddenly turns into a romantic coda and he makes a cryptic claim that he “only wants to rumble through your petrified forest.” It lasts only twenty seconds, but the complexity suddenly becomes a simple plea for a chance at love with someone who isn’t willing to accept his intentions. I also love the weird eroticism and playfulness at work on this album. 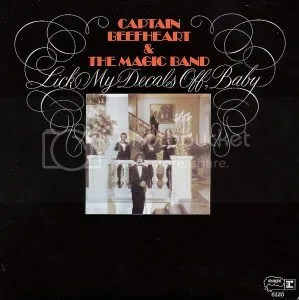 On the title track, the old Captain is kind of a love starved soul that devotes his time to “licking you everywhere it’s pink” and to “lick his decals off, baby.” There is more than a perverse tale at work as the Magic Band drives the song along its own peculiar manner. Yes, the the image of Captain Beefheart licking every inch of you may inspire disgust or an idiosyncratic explosion of the sexual kind, but one must admit that his paean to hedonism is quite an image to have lodged in your noggin. Overall, Lick My Decals Off, Baby is the last we would see of the unhinged and somewhat insane side of the band before they became a bit more polished and bluesy. More importantly, his later songs fail to touch me like Decals, Mirror Man, Safe as Milk and much of Trout Mask Replica. This is his peak, but his slide is infinitely more entertaining than most musicians’ best compositions.